The hotel pool is the most relaxing spot in the whole resort which means that having a great view is paramount. Some of the best pools have a vanishing edge, resulting in a beautiful transition between the blue of the pool and that of the ocean. Whether you prefer a pool that's steps from a sandy tropical beach or one high up on the hill looking down at the ocean, here are twelve island getaways with the best views. Some of these pools are completely private. Others are huge resort-size multilevel structures with curvy shapes that wind around the white sandy beach. 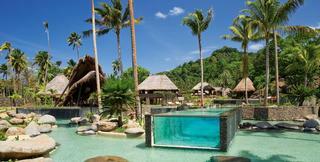 We've even added a pool that does not have a view of the ocean - it is surrounded by thatched roofs and tropical plants. We couldn't resist including two incredible pools in Bora Bora because the island is simply spectacular with its bright blue lagoon and white puffy clouds. Our list includes amazing places in Thailand, in the Caribbean and in the Maldives. Plan a romantic proposal next to one of these scenic pools, go on a honeymoon or celebrate your anniversary. 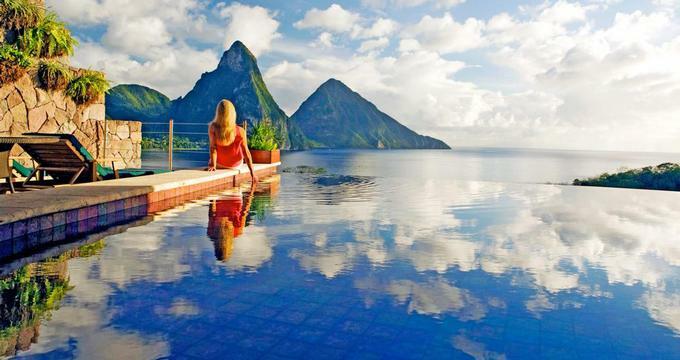 When you check into Jade Mountain you will be able to relax in a private pool with incredible views of the famous Pitons in St. Lucia. The sanctuaries at Jade Mountain all have infinity edge pools where you feel like you are floating above the island, which you pretty much are. Enjoy scenic views of the Caribbean Sea while you sunbathe on the private terrace of your luxury suite. 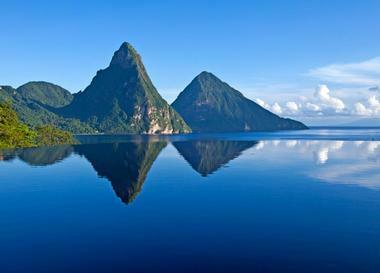 The Gros Piton and the Petit Piton are two volcanic mountains in a World Heritage Site on the southwestern coast of the island of Saint Lucia. The outdoor terrace is an extension of the living room space, perfectly combining indoor and outdoor island living. The bathroom is elevated so that you can enjoy the view while you bathe in the luxurious two-person tub. Jade Mountain is a hotel within a hotel which means that you will have access to all of the amenities and activities at the Anse Chastanet Resort. Rates start at USD $1,025 per night. This multi-level structure at Hilton Bora Bora Nui lets you swim surrounded by azure waters of Bora Bora's blue lagoon. Enjoy the swaying palm trees, puffy clouds and plenty of angles from which to take perfect tropical vacation photos. Guests get to relax right on the white-sand beach and grab a kayak to go paddling in the lagoon. At sunset, go for a romantic stroll on the beach and order a tropical drink at the bar. The circular design blends in with the design of the surrounding buildings. Wide steps lead into the pool's lower level, or you can access the upper level from above. This a relaxing spot for laying out in the sun with a view of the ocean. Bora Bora offers many things to do, including great snorkeling and scuba diving, shopping for Tahitian pearls, perfumes, art and wood handcrafts. You can be as active or relaxed on your vacation to this tropical island. Spend your days lounging with a view, or get more active, the choice is yours. Check into an Ocean Front Suite at THE MODERN HONOLULU and wake up to the most incredible views of the Pacific Ocean right from your bed. Guest rooms feature a sleek minimalist design with plenty of natural light and marble spa bathrooms. Ask for one of the rooms with a private terrace where you can sip a cocktail while you watch the sunset. For an extra treat, book the fabulous Penthouse Suite with a 1,500-square-foot wraparound terrace where you can have romantic honeymoon dinners. The Penthouse Suite has its own entertainment center, library, dining room, kitchen and master bedroom. The resort has stunning outdoor pool decks. Sunrise Pool & Bar has lounge chairs in the shallow areas so that you can sunbathe surrounded by water. Sunset Pool & Bar features a private man-made beach and an ocean view bar. 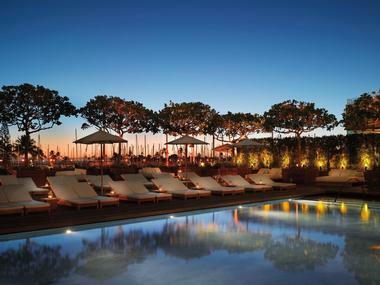 The pool is surrounded by teak lounges, daybeds and hammocks, perfect for relaxing with a view. The Study is a stylish indoor space next to the lobby where you can eat, drink and socialize. Morimoto Waikiki serves a contemporary Japanese menu created by Iron Chef Morimoto. Sample a fresh selection of Hawaiian seafood, island grown fruit and vegetables. After dinner, head to the Addiction Nightclub where you can dance the night away under a custom designed light sculpture with 40,000 antique light bulbs. The hotel has a spa with four treatment rooms and a fitness center. Rooms start at $279 per night; suites from $479 (855-970-4161). Laucala Island in Fiji offers a selection of pools to its guests, from the private villa pools overlooking tropical foliage and the ocean, to the stunning transparent lap pool set on top of a free form resort pool shown in this photo. You can swim laps and open your eyes under water to look around at the scenery. Before you know it, you will find yourself swimming laps just to get this unique perspective from the glass. Or simply relax near the edge and enjoy the view. You will be virtually alone on this exclusive private island which used to be owned by the Forbes family. The island has just 25 guest accommodations (all of them luxury villas). Perfect for honeymooners who want to be alone on a luxury private island, this Fijian hideaway is one of a kind. Yemanja is home to this stunning infinity edge pool, surrounded by tropical plants, fragrant flowers and Caribbean Sea views. 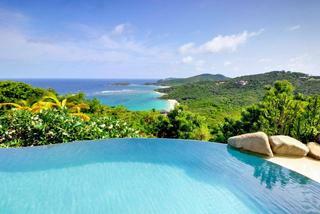 Plan a family reunion or a honeymoon to this unique island hideaway on the island of Mustique. At night, take a dip and watch the clear starry night sky above. There is shade, as well as an open deck with plush lounge chairs for resting in the sun. A hammock hangs on two posts right at the edge, taking advantage of the incredible ocean views. Stone steps lead into the pool and there is a stone ledge as well where you can sit facing the view. The covered poolside terrace has comfortable sitting so that you can have snacks without leaving. Although the vanishing edge pool at the Viceroy Bali doesn't have a view of the ocean, the scenery is no less impressive. While you soak in this blue-green pool in Bali, you will be surrounded by the sights and sounds of a tropical valley: lush forests, native birds and thatched rooftops of the local buildings. 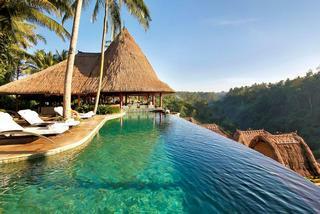 Guests who value privacy and seclusion will love the villas at the Viceroy Bali. You will be completely undisturbed. Drive an electric buggy from your secluded villa. Stay for the day, enjoying a lunch with a view at the restaurant. Or take a quick dip and head to the spa for a Balinese massage. At night, there is a romantic backdrop to the resort restaurant. The private villa pools on Naka Island feature a blend of modern and traditional design. The pools have stone steps just slightly submerged under water that lead to a small island in the middle, just big enough for a couple of lounge chairs and an umbrella. You will be surrounded by water entirely as you lounge on this spectacular pool facing the ocean. There is also a round plush sitting area with light and dark blue pillows complementing the colors of the ocean and the sky. All the colors of the pillows and the umbrella are ever so carefully chosen to blend with the natural surroundings. The stone steps and the little stone island in the middle are bright white. If you lounge by the edge, it will seem to disappear in the ocean. In the evening, enjoy a romantic sunset, have an outdoor massage, or ask the resort to set up a custom private dinner. If you are looking for a setting for the ultimate romantic wedding proposal, this private island in Thailand is the way to go. 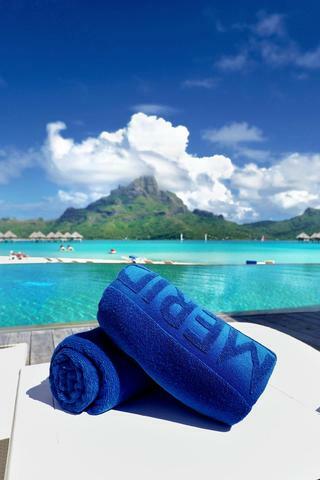 When you sit on the deck at Le Meridien Bora Bora, the blue of the pool seems quite closely matched to that of the ocean. Even as the water darkens at sunset, both colors are nearly identical. From the free-form vanishing edge, you will be able to see the thatched-roof overwater guest bungalows and the volcanic mountain at the center of the island. The resort is built on a small island (called motu in Tahitian) surrounding the lagoon. 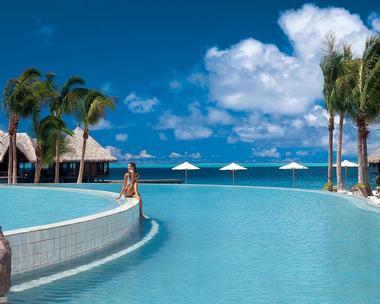 At Le Meridien Bora Bora, you can choose from beach and overwater bungalows, some with glass bottom floors. Have a refreshing tropical drink at the bar which also serves light snacks. Jump in the ocean for a quick snorkel with tropical fish. Villa Nonsuch at Nonsuch Bay in Antigua is perfectly positioned so that its private infinity edge pool seems to cascade into the water below. The villa is set 150 feet above the azure waters of the bay. Guests enjoy spectacular views of Green Island, the Atlantic Ocean, the sheltered waters of Ayers Creek and tropical landscape. The villas has 5 bedrooms with walk-in showers and ipod docks. There is a fully equipped gourmet kitchen and living room which open onto a shaded outdoor dining area. The infinity edge pool is 50 feet long and is surrounded by a relaxation deck with lounge chairs. Guests of the villa have access to all of the Nonsuch Bay resort services, including the clubhouse restaurant and bar, watersports facilities, sailing school, private sandy beach and 3 infinity swimming pools. 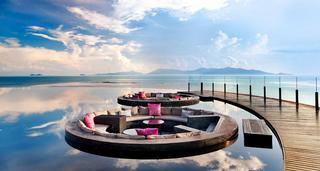 Lotus Pond at the W Retreat Koh Samui offers stunning views of the surrounding ocean. Guests step onto two platforms equipped with plush brown pillows with pink accents. Have a drink surrounded by the natural beauty of the island. 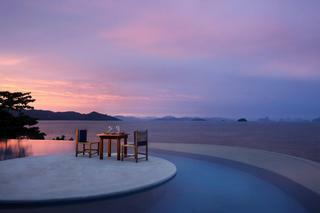 We recently featured the Wow Ocean Haven at the W Koh Samui in our collection of the Best Secluded Romantic Getaways. The Wow Ocean Haven has a private pool overlooking lush tropical greenery and the ocean in the distance. All the guest accommodations at this unique hotel have scenic ocean views and spacious terraces from which to enjoy them. Lotus Pond is the signature view of the property, with its contrasting pink pillows and the pool which seems to disappear into the ocean beyond. 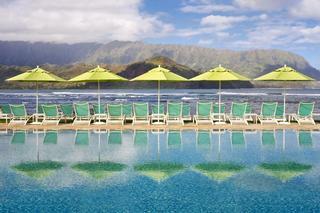 The pool at the St Regis Princeville Kauai is located steps from the sandy beach and the ocean. 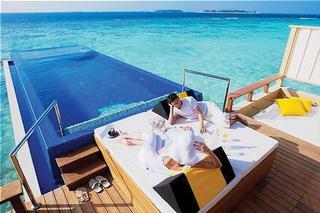 Guests can sit in chairs in the water in this free-form swimming pool which is surrounded by black rock on one side. Green colored umbrellas contrast with the blue of the ocean and provide shade from the tropical Hawaiian sun in the middle of the day. The beach bar serves delicious tropical drinks, including the famous Hawaiian Mai Tai. At night, the resort lights tiki torches which provide romantic ambiance on the beach. The St Regis is located in Princeville on the north shore of the island of Kauai. Vacation activities in the area include championship golf, kids' adventure center, zipline adventure, hiking and other outdoor activities. At Angsana Velavaru Maldives, private pools extend out and over the ocean, giving vacationers nearly 360 degree panoramic views of the ocean. We recently featured this resort in our collection of 10 Spas with Best Water Views and the views are equally stunning. Plush lounge area is elevated above ground to give you the best possible views. The infinity edge pool has wooden steps leading up to it. As you swim, you will be able to take in beautiful views and enjoy ocean breezes from the blue lagoon. Ask for a picnic snack and you never have to leave the view.